"I decided to push the envelope and toss in 2 cups of blueberries!" Preheat the oven to 375 degrees F (190 degrees C). Grease 16 muffin cups, or line with paper muffin liners. Beat butter and sugar in a large bowl until light and fluffy, about 3 minutes. Stir in eggs until well mixed. Add vegetable oil, stir to combine. Whisk sour cream, milk, and lemon zest into butter mixture until smooth. Stir half the flour mixture into the butter mixture until combined. Add remaining half of flour mixture and blueberries into the batter, folding together until just combined. Place muffin cups on center rack of the preheated oven and bake until tops are golden and a toothpick inserted into the center of a muffin comes out clean, about 30 minutes. Perfect! I have been trying to duplicate these amazing muffins for over 20 years and have never found the right balance! Thanks Chef John! 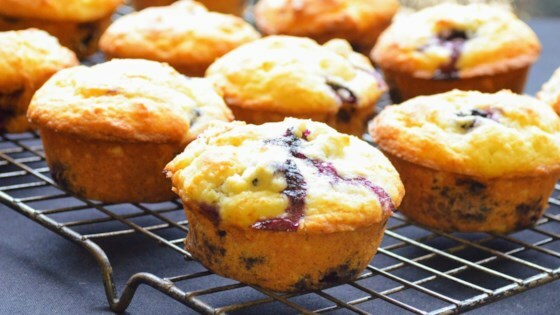 These muffins are not overly sweet and it truly allows the blueberries to shine in this recipe. I really liked the hint of lemon also. Very nice texture and crumb. Thanks Chef John!